We built this space station on rock and roll… and probably alien slave labor. There are three city-building games I enjoy playing: Suburbia, Castles of Mad King Ludwig, and Among the Stars. But if I could only play one, it would be Among the Stars. It’s partly due to theme. Building a semi-realistic city with lakes and sewage plants and schools is fine, but it’s not as interesting as building a space station with a race track, opera house, and minefield. It just isn’t. Turning the ordinary into something extraordinary by sticking it in space really grabs my attention. In Among the Stars, you’re building a space station. There’s intergalactic peace (yay!) so now is the time to create spots throughout the galaxy where various alien races can congregate and negotiate trade agreements or watch Space NASCAR on one of the racing tracks I’ve added to my station. Whoever builds the best station (based on Victory Points earned) wins the game. As you build out your station by placing down cards of different types (military, recreation, administration, diplomatic, and business) you have to be conscious of how these spaces affect one another. You may have a diplomatic card that gives a bonus if it’s not placed within two spaces of a military card. Or you may have minefields that give bonuses if clustered together, but ding you for being adjacent to spaces that would be populated by people. No one wants to step through a minefield to get to the opera house. The types of places you build matter as does their relation to one another. This is similar to the way other city builders work, particularly Suburbia and Castles of Mad King Ludwig. What separates Among the Stars from this worthy trio of games is its drafting mechanic. Games are split into four years and each year consists of six rounds. At the start of every year, you draw six cards. On the first round, you choose one of these cards to play and pass the rest to the left. Every round continues this way, with the offering of cards growing slimmer. I love drafting in games and I don’t think it’s used nearly enough. 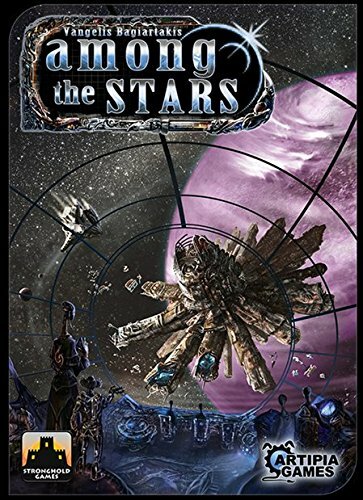 In Among the Stars, it forms one of the core strategic pillars of the game. It’s not just about finding the right card to play that round, but also thinking about what the other players need. If I see my friend Tom is once again building a military powerhouse, do I want to send him a card I know benefits him? I could burn the card. Uh, not literally – that would be a very different sort of game. You have three choices on your turn: You can play a card into your station on your turn, discard it for a power reactor to provide necessary energy to your station, or discard for some cash. Even if I have no need for a particular card, I may want to turn it into cash just to keep it out of the hands of a competitor (AKA burn it). Among the Stars - on year 3 of a game. Early in each year, I also have to realize that a couple of cards from my initial hand will make it back my way. If I can deduce other people’s strategies, I could leave a card valuable to myself in the stack and hope that it returns to me before the year is over. I fell in love with Among the Stars the first time I played it. Some of my friends enjoyed it too, but none connected with it like I did. It’s understandable. There’s more nuance to Suburbia, the undisputed king of city builders. Well, disputed by me, but to most, Suburbia is the Grand Poobah. But I think those allegiances may begin to change with the addition of an important expansion to Among the Stars. Ambassadors... come out and Playeee-ay! Among the Stars: The Ambassadors is far from flashy. It adds some new cards to the mix that sprinkle in more variety to what you can build. But the important addition seems almost minor, yet it builds one small layer of complexity to Among the Stars that it sorely needed. The expansion adds a row of Ambassadors you can bring to your station on your turn. Each has a unique power, often assisting you with earning some extra Victory Points. To add an Ambassador, you discard your card, pay the cost on their card, and add a bureau to your station where they can set up shop. This might not seem like much, but adding a fourth option for a turn adds a new layer of strategy. More importantly, it adds an alternative to discarding a card you don’t want for money you may not need at the time. Expansions have a danger of unbalancing a well-designed game. 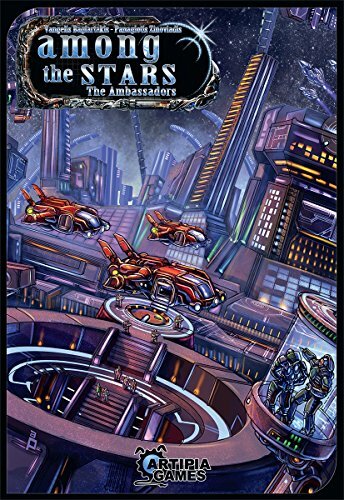 Among the Stars: The Ambassadors is one of the few that actually adds more balance and a touch more depth. When I recommend Among the Stars (and I do), it’s with the caveat that you also pick up The Ambassadors. Now, it’s not all roses for Among the Stars. It falls into the same trap as most city builders. Many cards you place in your station have delayed effects that only deliver Victory Points at the end of the game if you meet certain conditions. As your station grows, you have more and more to keep track of – also worrying about what your opponents are up to. This leads to scanning chunks of small text on cards repeatedly. It feels like an unnecessary burden, placed on us from a lack of an innovative design choice. I've built the ultimate space station! Inevitably, someone always seems to come away from Among the Stars feeling like they missed out on something. “Oh, I forgot I needed to get more of these.” If nothing else, developer Artipia Games could have created better iconography to lessen the word bulk and allow a quick look at a card to provide an understanding of its bonus conditions. Sure, it has a few problems, but so does every city builder I’ve played. For me, Among the Stars stands out for its card drafting, its fun theme, and its great balance. Nicely balanced – no sure path to victory. These are space stations I want to visit! Important blocks of text in a relatively small space. Can be a pain to separate all the cards before/after a game. Not as good without the Ambassadors expansion. You like Babylon 5 or Deep Space 9 and want to build your own space station. You’ve tried and liked other city builders. You’ve always wanted to bring NASCAR into space.